A puppy's nutritional needs require planning to meet. It's like caring for a newborn baby except you aren't prepping bottles with formula or changing diapers. Yet the increased level of care is similar and just as important to the future health of your pup. Knowing just how much and how often to feed your puppy's growing body matters. It isn't always possible, but when it is, it truly is best for the puppy to nurse from its mother for at least the first four weeks of its life, according to the ASPCA. Mother's milk -- especially the first milk known as colostrum that contains specially designed antibodies passed from mother to offspring -- meets a puppy's initial nutritional needs. 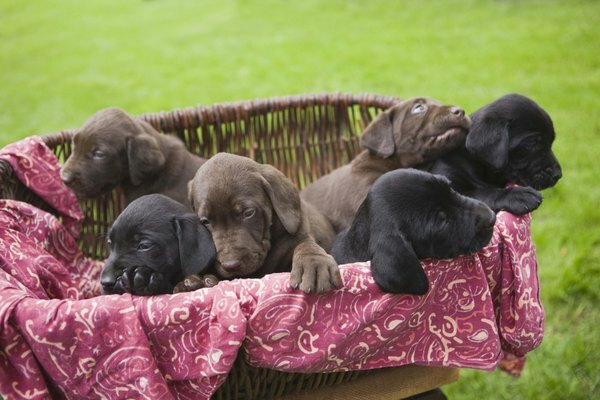 According to Petside, weaning from the mother can begin as early as three weeks of age and continue over the next three to four weeks to gradually transition the pup to other foods. The growing body of a puppy -- especially one of a larger-size breed that experiences significantly larger weight gains in short periods of time -- requires twice the energy intake as compared to an adult dog, according to the ASPCA. The building and strengthening of muscle tissue is best accomplished with a high-protein diet. Puppies need a food with anywhere from 25 to 30 percent protein to accommodate their growth. Not all puppy foods contain the same nutrient levels. According to WebMD's Healthy Dogs Guide, puppy foods meeting the nutritional guidelines established by the Association of American Feed Control Officials receive a seal of approval from the organization. Beyond that, verifying that the food being purchased is formulated for your puppy's stage of development can also be done by scanning the product label. Pet Place, which offers advice from contributing veterinarians, recommends feeding a puppy three times per day. Cesar's Way, which offers advice from canine behavior expert Cesar Millan and veterinarians approved to answer questions posed on the site, suggest three to four meals with a focus on smaller portions that are easier for the puppy to digest and prevent him from experiencing dramatic highs and lows in energy levels between meals. Once a pup reaches six months of age, twice-a-day feeding is an option as long as the dog shows stable growth. However, in the case of smaller breed dogs that are more prone to blood-sugar spikes, Pet Place recommends to continue feeding three times per day. That indeed is the $64,000 question when it comes to puppy feeding. The best answer is to follow the advice of your veterinarian and the label on the food he recommends. Cesar's Way suggests feeding a half cup three times per day. The Dog Breed Info Center offers a chart for feeding adult dogs based on breed and weight with a caveat that puppies can eat up to double the highest amount listed on the chart. For instance, the chart indicates that an adult Scottish terrier weighing between 10 and 25 pounds should be fed up to one cup of food per day. That means a puppy could eat up to two cups to accommodate growth needs. The WebMD Healthy Dogs Guide also gives a nod to the professionals in determining how much to feed a puppy. It suggests monitoring what comes out puppy's other end to determine if your growing baby is getting appropriate nutrition. If your pup's poop is a "formed brown feces," it is a sign your puppy is digesting most of the nutrients in his food. Meeting nutritional needs is much more important when raising a puppy than adhering to a specific amount of food. Pet Place: How Much Should I Feed My Puppy? How Do Cats Keep Their Tail Up?